During 1964 a completely new type of Lambrettas became available, the 'i' range (i for Innocenti) but because the 'i' logo looked remarkably like a J, it was mistakenly called the 'J' range (also there is no J in the Italian alphabet). A prototype of similar design was shown to the public over three years previous at the Milan motor show in 1961, although the final production example was a little different. It had an all steel pressed monocoque chassis, with centrally mounted engine similar in design to the L.i, but with a vertical cylinder. To start with three engine sizes were available, 50cc, 100cc and 125cc. The monocoque frame was smaller then all other families models of Lambretta, and it was thought the J range was primarily designed for ladies, being lightweight and using smaller stretch levers. The models had no horn cover (except the Starstream) a plastic tool box was fitted underneath the seat, and if this was taken out you could gain access to the air filter. The J range retained side panels to cover the engine bay, most were the handle type. Dependant on the model the J either had ne bench seat, one single, or twin singles. All trims were always grey on these models, again as with almost all other Lambrettas bar the stand feet and kick start pedal rubber which were black. J50 was never brought in the UK by Lambretta concessionaires, although three models did arrive for evaluation. Starting in October 1964, the 50cc engine had a three speed gearbox, and an output of 1.47bhp gave it a 25mph top speed. Initial examples wore 10 inch wheels, but these were changed to 2.75*9. 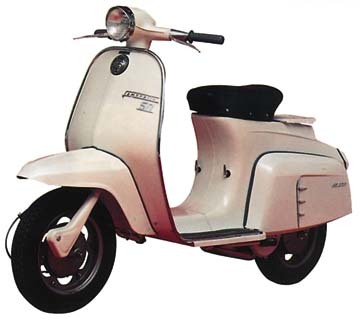 The J50 had a dual seat as standard, although to market the scooter as a budget form of transport, no speedo, leg shields beading, and no steering lock, while other changes were a much smaller rear light. Although this last item probably costed more, as in its place of that and where the number plate went was a fluted panel with a chrome J50 badge. 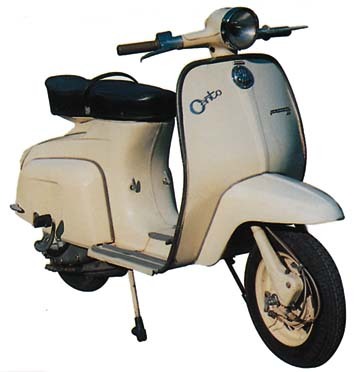 As for the rest of the badging, a single piece Lambretta J50 badge was fitted to the leg shields, with a innocenti badge just below the headset. The three speed version was replaced by a four speed model in September 1966, which retained most of the features of the three speed model. The main change was brought in November of the same year, with a new frame which was stronger, due to consumer fears from other models. To go with this a new thinner dual seat was fitted, trimmed leg shields, and a modified rear section. The four speed model gained no extra speed form its extra gear however, still capable of 25 miles an hour. The J50 4 speed was replaced in January 1968 by the J50 De Luxe, which reverted back to a three speed gearbox. The De Luxe sported a single front seat, with a rear rack in place of passenger carrying capabilities. The leg shields got trims on this model, being chrome surround. The side panel handles were now defunct, being replaced with a clip on type, as found on the larger bodied machines of that time. The flooring was changed from the earlier plastic floor strips, to alloy channels with rubber inserts again as the larger bodied machines. Other changes were using 3.00*10 tyre sizes, with aluminum grey colour painted rims, and hubs. The J50 badging was retained on the leg shields, but the side panels gained a De Luxe badge panel flashes on either side, similar to those found on the SX models of that time. The 'Cento', as it names suggests is 100cc, or 98cc with the factory name being J98, while a bigger engine version was simply called the J125, being of course 125cc. Both models were a monocoque frame, pressed from steel, with two side panels and no horn casting. Both were equipped with a dual seat, vertical cylinder engine fairly similar in design to the Li range, but with a 3 speed gearbox. Rear suspension again was joined to the engine as per larger frame models, with front mounts which allowed the unit to pivot. How ever the spring and damper unit were two seperate items, and the engine mounts were not really capable of offering riders a smooth ride, as most machines tend to vibrate. Front suspension was trailing link with springs inside the front forks, the links sat on bolt in rubber buffers. 3.00*10 tyres were fitted with finned drum brakes front and rear. The 98cc model produced 4.7hp which gave it a top speed of 46mph, while the 125cc output was 5.8bhp and a speed of 54mph saw both models capable of staying with the larger framed models in terms of top speed. The J100 production was stopped in November 1965 with 17,642 examples being made, while the J125 lasted a little longer until October 1966. All in all although the J range models were not a huge success, it proved Innocenti were prepared to diversify in order to satisfy customers, and improve profit and sales of their products. In a bid to keep the J range alive Innocentis next model was the Starstream, launched in May 1966. Although very similar to the J100/125 a redesign saw the Starstream gain a turning front mudguard, trimmed down from leg shields for streamlining, a new seat mounting, and a bolt horn casting, although with nothing underneath it! Early examples retained the handle type side panels, later models gained the clip on type. Bolt in fork buffers were replaced by clip in items. Engine wise it was basically a J125 but with four speeds, paint was two tone, with the side panels and horn cast gaining the second colours of either red or blue. The main body could be chosen in blue, silver, metallic blue, white or yellow. A chromed start badge with 125 inside it was fitted to the leg shields. With the change to four speeds, the Starstream and Super Starstream had pretty good acceleration and a top speed of 55mph. The Starstream and Super Starstream were built along side each other with the end being signalled in April 1966 when production stopped.During 1964 a completely new type of Lambrettas became available, the 'i' range (i for Innocenti) but because the 'i' logo looked remarkably like a J, it was mistakenly called the 'J' range (also there is no J in the Italian alphabet). A prototype of similar design was shown to the public over three years previous at the Milan motor show in 1961, although the final production example was a little different. It had an all steel pressed monocoque chassis, with centrally mounted engine similar in design to the L.i, but with a vertical cylinder. To start with three engine sizes were available, 50cc, 100cc and 125cc. The monocoque frame was smaller then all other families models of Lambretta, and it was thought the J range was primarily designed for ladies, being lightweight and using smaller stretch levers. The models had no horn cover (except the Starstream) a plastic tool box was fitted underneath the seat, and if this was taken out you could gain access to the air filter. The J range retained side panels to cover the engine bay, most were the handle type. Dependant on the model the J either had ne bench seat, one single, or twin singles. All trims were always grey on these models, again as with almost all other Lambrettas bar the stand feet and kick start pedal rubber which were black. With the change to four speeds, the Starstream and Super Starstream had pretty good acceleration and a top speed of 55mph. The Starstream and Super Starstream were built along side each other with the end being signalled in April 1966 when production stopped.